USA’S #1 BEST SELLING Natural Booster. at university of Malaysia and MIT. AMERICA’S HIGHEST RATED BOOSTER – TEST WORx delivers noticeable and substantial increases and improvements in energy, stamina, recovery, sleep, mood and performance in the gym, at work and on and off the field. Over 1,000,000 capsules sold! 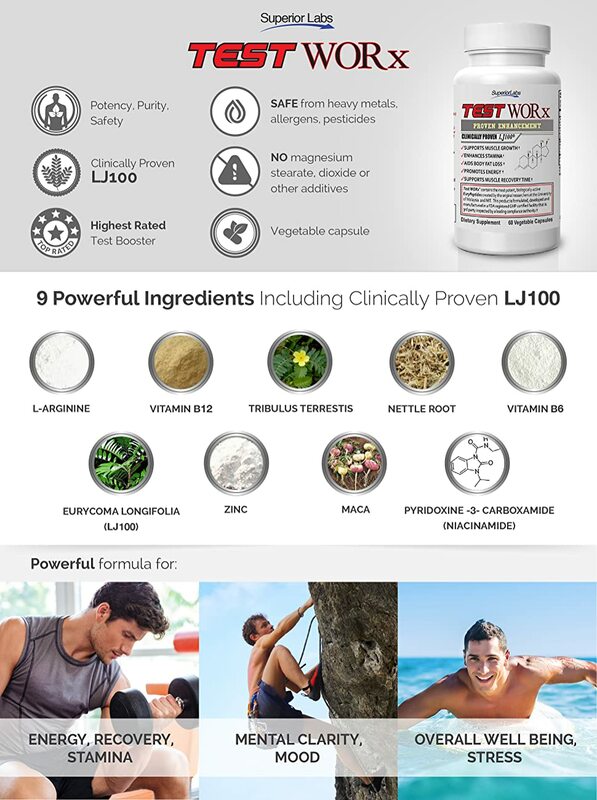 CLINICALLY TESTED LJ100 and 8 OTHER PROVEN INGREDIENTS – LJ100, a standardized extract of the Tongkat Ali plant, has been clinically proven to reduce SHBG which inhibits the body’s energy, stamina, recovery, sleep and mood. No other formula contains this blend of ingredients designed to provide a substantial and noticeable increase to energy and performance. POTENT, PURE, CLEAN AND TRUSTWORTHY – No magnesium stearate, titanium dioxide, sodium dioxide or any other additives listed or any other artificial fillers. We test every ingredient for heavy metals to help protect you from industrial metals pollution. Manufactured in facilities independently certified, by 3rd party quality organization.